Higher collective consumption of sweetened fruit drinks, soda, and water was associated with a higher likelihood of developing chronic kidney disease (CKD) in a community-based study of African American adults in Mississippi. The findings, which appear in an upcoming issue of the Clinical Journal of the American Society of Nephrology ( CJASN ), add to a growing body of evidence pointing to the negative health consequences of consumption point out sugar sweetened beverages. "It There is a lack of comprehensive information on the health effects of the diverse beverage options available in the food supply industry, "said Drs. Rebholz. 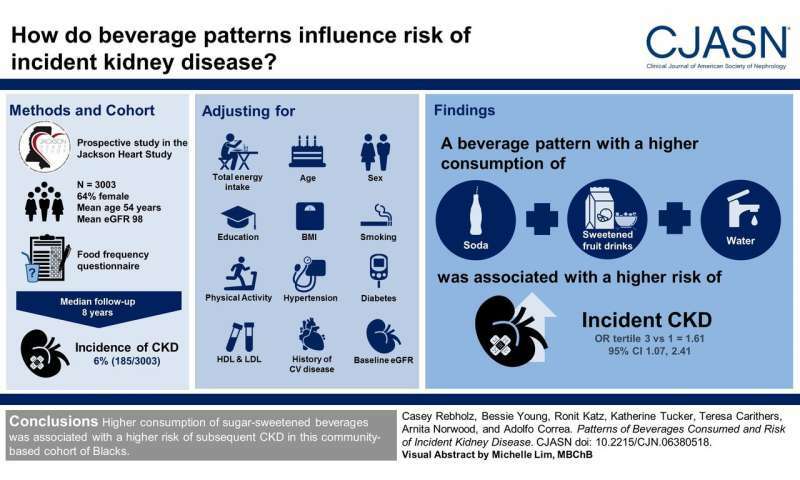 "In particular, there is limited information on which types of drinks and beverage patterns are particularly associated with the risk of kidney disease." Among the 3003 participants, 185 (6%) CKD developed over a mean follow-up of 8 years. 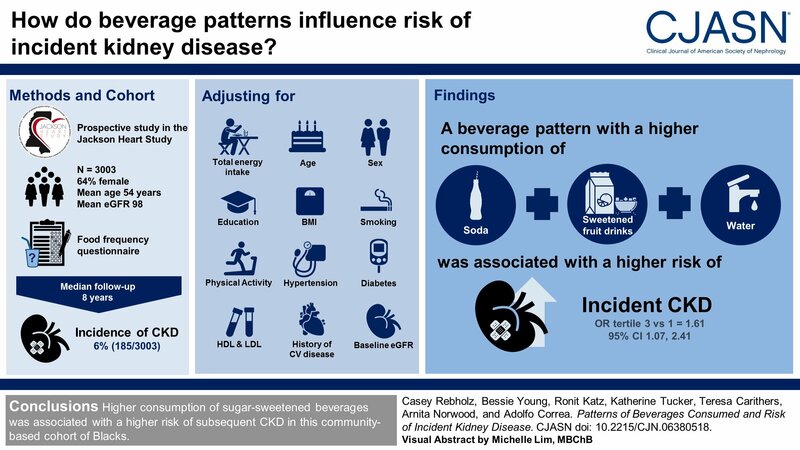 After adjusting for confounding factors, consumption of soda, sweetened fruit drinks, and water was associated with a higher risk of developing chronic kidney disease. Upper Tertilers consuming this beverage pattern were 61% more likely to develop CNE than those in the lower Tertil. The researchers were surprised to see that water is a component of this beverage pattern associated with a higher proportion of risk of CNI. They found that study participants may have reported their consumption to a variety of types of water, including flavored and sweetened water. Unfortunately, investigators in the Jackson Heart Study did not gather information about certain brands or types of bottled water. In an accompanying editorial, Holly Kramer, MD, MPH and David Shoham, Ph.D. (Loyola University Chicago) noted that the findings have a strong impact on public health. "While some selected US cities have successfully reduced the consumption of SSB [sugar sweetened beverage] through taxes, all other municipalities have turned against public health efforts to reduce SSB consumption," they wrote. "This cultural resistance to lowering SSB consumption can be compared to the cultural resistance to cessation of smoking in the 1960s after the Surgeon General Report was published." In the 1960s, tobacco consumption was considered a social option rather than a social choice as a medical or social public health problem. " In an accompanying editorial by Patient Voice, Duane Sunwold explained that he is a patient with CNI who has changed his eating and drinking habits in order to remorse his illness. As a chef, he makes a number of recommendations to patients who are trying to reduce the consumption of sugar-sweetened beverages.